Megan Humphries is a Harrogate based harpist who currently studies in year 13. Following her recent auditions for music conservatoires, Megan is privileged to have been offered a scholarship at the Royal Academy of Music, London. Megan has dedicated herself to music for over ten years now, beginning first with piano then adding harp at the age of 10, one of Megan’s main aspirations was to be accepted into the Royal Academy of Music knowing that many of her inspirations have trained there. The Royal Academy of Music is one of the most prestigious conservatoires and is world renowned for the highly successful musicians it has both employed and trained since 1822; some of the alumni include Sir Simon Rattle, Dame Evelyn Glennie, Sir Elton John and Katherine Jenkins. Within the harp department, three Royal Harpists to the Prince of Wales have also studied there, one of which is Megan’s current tutor, Claire Jones. When visiting the Academy, Megan noted that it offers endless opportunities for its students to learn from both the tutors and the other students. It surrounds its students with an unbelievably high calibre of musicianship and is the choice of brilliant young musicians such as BBC Young Musician winner, Sheku Kanneh-Mason. For Megan, it felt undeniably like the right place for her to begin the steps towards her dream career of being a free-lance musician. Megan aims to do “anything and everything harp” from solo work to orchestral and ensemble work, teaching to recordings and anything else in between. The undergraduate course that Megan will begin in September 2019 will last four years and focuses on the harp, offering her one-to-one tuition alongside orchestral, ensemble, aural and sight-reading classes, equipping her with the necessary skills to create the successful career she’s already working towards. Her audition preparation already has given her an insight to the skills she will build upon in the Academy; her audition included a performance of three pieces (one of her own choice, one composed post 1950 and one technical study), an interview, a sight-reading test and an aural test. She was also invited to play for the principal of the Royal Academy of Music, professor Jonathan Freeman-Attwood CBE, in a further audition. Alongside the success in her auditions, Megan has also been accepted into the National Youth Orchestra of Great Britain as one of only four harpists from across the country. The NYO is one of the greatest orchestras of teenagers in the world, performing in the majority of the most well known British concert halls (including the Royal Albert Hall for the BBC Proms) and recording for BBC Radio 3, aiming to inspire the next generation of young musicians. 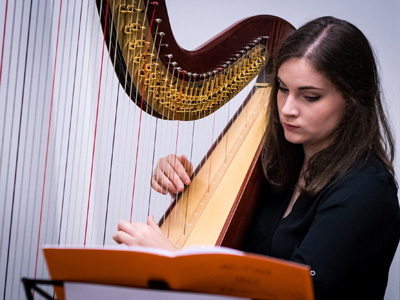 She is also currently involved with the Claire Jones Concert Ensemble, a group formed of other young, high standard harpists from across the country and plays with the City of Leeds Youth Orchestra, who she will be performing a solo with in May.